Installation was an arduous task. 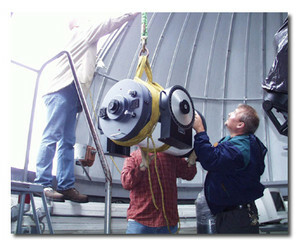 Many parties took part in getting the telescope carefully mounted and installed. 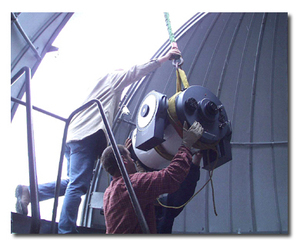 The first hurdle was to get the large and heavy optical tube into the 40-foot high dome. Many thanks to Conrad Electric Co. for donating their services and equipment to hoist the tube into the dome. The concrete pillar on which the telescope is permanently mounted was carefully leveled to within about 1 mm by Paul Shedlock. 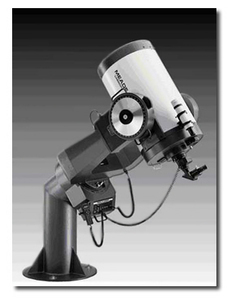 To find true north, the old telescope was pointed at Polaris when it was nearly crossing the celestial meridian and a plumb bob was dropped from the front and back of the tube; then the dots were connected. This finding was confirmed by hanging a metal bar at exactly astronomical noon, that is, when the sun was exactly due south. This cast a shadow due north, which was then traced. The two methods matched remarkably well! Eventually this determination of north will be tested using the “Drift-method.” Astronomical noon was determined using The Sky Planetarium program and our time was synchronized with standard naval time. 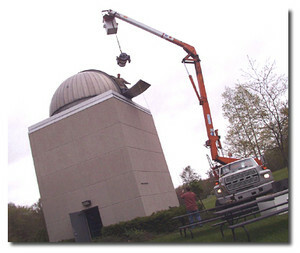 The actual assembly of the telescope and its mount was done by Penn State Wilkes-Barre's talented maintenance staff, headed by Paul Chocallo.